"This is a cold day, stick-to-the-ribs type of soup. Serve with French bread and a good salad and you'll feel good. If, while making this soup you find it to be too thick, just add heavy cream or water to dilute." 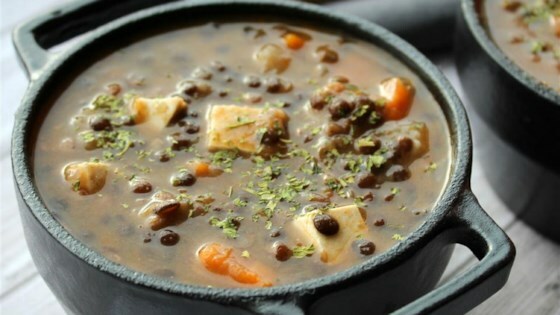 Place lentils, onion, carrots and cabbage leaves in a pressure cooker and cover with 1 1/2 inches of water and 4 tablespoons oil. Cook about 10 to 15 minutes and then cool until pressure reduces, then open. In a food processor or blender, puree soup until smooth. Add cumin, black pepper, cinnamon, all spice, cloves and nutmeg. Transfer to a stock pot and return to heat. When soup is just beginning to boil, stir in onion soup mix. Simmer until thickened and then just before serving season to taste with lemon juice and salt. Blah and too sweet. I didn't think the whole cinnamon nutmeg cloves thing would work and it didn't. It was so delicious! My family loved it.